The Biblical Prohibition Against Charging Interest: Does It Apply To Us? 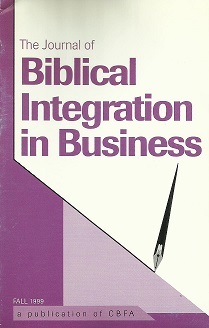 Comments about “Marketing in the New Millennium: Motivational Differences Between Traditional and Non-Traditional Christian Business Students"
Organizational Control Through Trust: A Biblical System? Student Culture and Christian Business Programs in the 21st Century: Accommodation or Transformation?